Old Company Stock Research Service is the world’s leading provider of Old Stock and Bond Research Services. Scripophily.com’s Old Company Research is the successor, publisher and owner of all material published by the Marvyn Scudders Manuals, the Robert D. Fisher Manuals, R.M. Smythe and Herzog & Co., Inc. obsolete research services. Our services have been performed continuously since 1880. Old Company Research is owned and operated by Bob Kerstein (The Old Stock Detective) who is a Certified Public Accountant, a Chartered Global Management Accountant (CGMA), a member of the California Society of Certified Public Accountants, Virginia Society of Certified Public Accountants, and the American Institute of Certified Public Accountants. 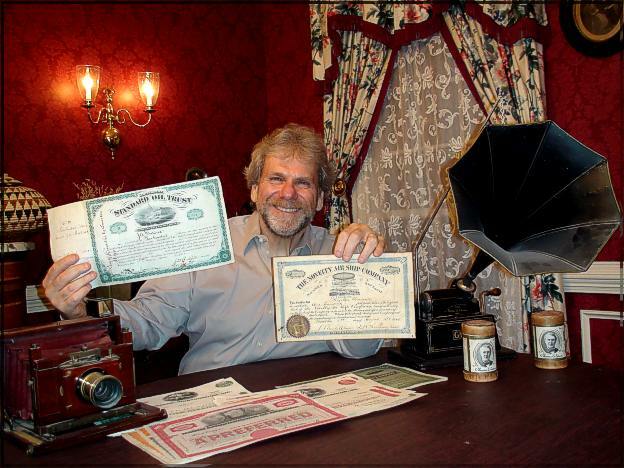 Old Stock Certificates may still be valuable even if the stock no longer trades under the name printed on the certificate. For a flat fee of $39.95 per company, our Old Company Research Service will provide you with a brief status profile of companies whose original identities have been lost due to a change in name, merger, acquisition, dissolution, reorganization, bankruptcy or charter cancellation. In our report, we will also provide any surviving company contact information and links to unclaimed funds’ websites, so you can determine if any state is holding unclaimed stock certificates or funds in your name. We do not charge any commissions for monies or unclaimed stocks you recover. 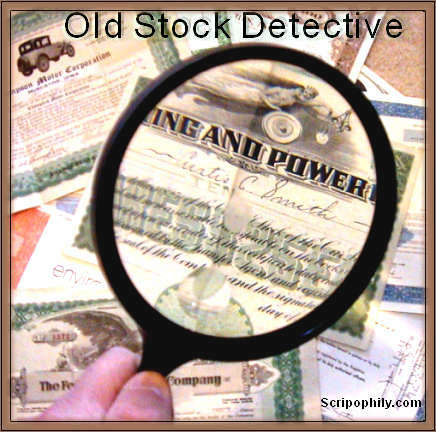 As one of the largest buyers and sellers of collectible stock and bond certificates (Scripophily) in the world, we will let you know if your certificates have any collectible value, if it is determined the certificates have no redeemable value. The resources used in determining your research report includes our experience and large proprietary library of old company stock and bond research performed during the past 135 years which includes information from the Marvyn Scudders Manuals, Robert D. Fisher Manuals, R.M. Smythe and the Herzog & Co., Inc’s obsolete research service reports, and other reliable sources. You can find additional information about our Old Company Research Service at OldCompany.com. Please be advised that this process usually takes anywhere from several days up to three weeks once the order is placed. Call us for quantity discounts or the need for expedited service. We offer this service for stocks and bonds issued from anywhere in the world. If we do not find what happened to the company, you are not charged for our service or time. In fact, you credit card is not charged until we find out what happened to the company. If you would like to use this service please go to top or the bottom of this page and complete the information form. The minimum information we need to start the process is the company name, state of incorporation, and the date the certificate was issued. Once you complete the information form, please click on “Add to shopping cart”. If you have more than one company to research, please click on [ + ] Add another company above and another template will appear for another company’s information. If you would rather order by mail or fax, or you can print out our Mail and Fax Order Form by Clicking Here to send us the information. If you have any questions, feel free to call us toll free at 1-888-786-2576 or 703-787-3552 (Direct) or send us an email to Old Company Research .